The aim of this paper was to describe the mechanism of action of monoclonal antibodies, which are powerful PCSK9 inhibitors, and their effects on the lipids studied in various clinical research trials. Studies on their safety and adverse effects were searched. Long-term trial effects, cost-effectiveness, present indications, future perspectives and CVOTs on PCSK9 inhibitors have been outlined. Recent literature on PCSK9 inhibitors was searched. The PubMed and Embase databases and recent conferences held in 2014, 2015 and 2016 were searched. Various RCTs and three available meta-analysis studies were evaluated. The efficacy data included the effects on lipids and clinical outcomes as well as adverse effects. PCSK9 was discovered in 2001, and its gene was characterized in 2003.14,15 PCSK9 is initially secreted as an inactive enzyme precursor which undergoes intramolecular autocatalytic cleavage in the endoplasmic reticulum for activation. The matured PCSK9 moves out of the endoplasmic reticulum of the hepatic cells to be further handled by the Golgi apparatus of hepatic cells before entering the circulation. The preferential pathway through which LDLc is normally cleared from the blood is its binding with LDL(R)s on the surface of liver cells. LDL(R) is a mosaic protein of 839 amino acids which mediates endocytosis of LDLc into the liver cells. The bound LDLc/LDL(R) complex is internalized into the liver cells where LDLc is further metabolized, while the LDL(R) recirculates back to the surface of liver cells for further interaction with LDLc. This process continues for several cycles (up to 150 cycles). PCSK9 is an inhibitor of LDL(R). PCSK9 binds with LDL(R) on the surface of the liver cells and escorts it to the lysosomal system of liver cells for the destruction of LDL(R), which thus cannot return back to the surface of liver cells. The net result is a decrease in the population of LDL(R). Hence, less number of LDL(R)s are available at the liver cell surface to mop up LDLc for further metabolism. PCSK9 and LDL(R) are secreted by hepatocytes. Their intracellular itenares appear similar, but their pathways diverge at the surface of liver cells. PCSK9 is secreted into the plasma, while LDL(R) remains at the surface of liver cells. Circulating PCSK9 binds with LDL(R) on the liver cell surface and interferes with the recycling back of LDL(R) after internalization with LDL and directs LDL(R) to the lysosomes for its destruction. PCSK9 and LDL(R) are coordinately regulated by SREBP2. PCSK9 thus regulates the expression and degradation of LDL(R). PCSK9 circulates in plasma as mature and furin-cleaved forms. Total plasma PCSK9 is measured by ELISA incorporating a polyclonal antibody against human PCSK9.18 Normal mean plasma level of total PCSK9 is 99.3±31 ng/mL. LDL apheresis in FH removes mature as well as furin-cleaved forms of PCSK9. About 40% of intact PCSK9 is found in association with LDL. Most of the furin-cleaved forms are in the Apo-B-free fraction. About 25% of PCSK9 is associated with Lp (a) in plasma. Lp (a) is a highly atherogenic LDL(c)-like particle characterized by the presence of Apo-A which is covalently bound to Apo-B. Analysis of Lp (a) fraction by ultracentrifugation, immunoprecipitation and ELISA quantification has shown a strong physical association between Lp (a) and PCSK9 in plasma.19 Lp (a) levels are genetically determined. The desirable plasma Lp (a) level is <14 mg/dL (<3.5 mmol/L). Lp (a) levels >50 mg/dL are associated with atherosclerosis and are refractory to lifestyle interventions. Current therapeutic options to reduce Lp (a) are limited to Niacin and PCSK9 inhibitors. However, the mechanism of interaction between Lp (a) and PCSK9 is not clearly known. Monoclonal antibodies are potent antilipid drugs which inhibit PCSK9. Three monoclonal antibodies have undergone extensive trials for their efficacy and safety. These are as follows: Praluent (Alirocumab; REGN 727): manufactured by Regeneron (Tarrytown, NY, USA)/Sanofi Aventis (Paris, France); Rapatha (Evolocumab; AMBG 1451): manufactured by Amgen (Thousand Oaks, CA, USA); and Bococizumab (RN 316): developed by Pfizer (New York, NY, USA). Alirocumab and Evolocumab have been the front-runners of PCSK9 inhibitors recognized by the FDA and European Medicines Agency. Alirocumab was approved by the FDA on 24 July 2015 to be used in addition to diet and maximally tolerated statin therapy in adults with HeFH or patients with existing clinical ASCVD such as heart attack or stroke who require additional lowering of LDLc. The cost of Alirocumab in the USA is $14,600 per year. Evolocumab was approved by the FDA on 27 August 2015 to be used in addition to diet and maximally tolerable statin therapy in adults with HeFH and HoFH or patients with clinical ASCVD such as heart attack or stroke who require additional lowering of LDLc. The cost of Evolocumab in the USA is $14,100 per year. Bococizumab developed by Pfizer is under consideration for the FDA approval. Bococizumab has undergone Phase 2 trial. Ongoing Phase 3 trials include SPIRE (Studies of PCSK9 Inhibition and the Reduction of cardiovascular Events)-SI, SPIRE-HR and SPIRE-LDL (each 12-week trial). SPIRE-1 and SPIRE-2 are long-term CVOTs. Trials are being conducted simultaneously in the UK, the USA, and Europe. All monoclonal antibodies are administered by subcutaneous route. Their standard doses are summarized in Table 1. Note: aDose may be reduced if LDLc is <25 mg/dL. Abbreviation: LDLc, low-density lipoprotein cholesterol. Statins have been the mainstay of treatment of elevated LDC. They lower LDLc by inhibiting the enzyme HMG-CoA reductase which has a vital role in the synthesis of cholesterol in the liver. In addition, statins enhance the expression of LDL(R) (as well as of PCSK9). Statin typically reduces LDLc by 30–40% (depending upon the dose of statin), but absolute value of LDLc rarely falls <60 mg/dL. Monoclonal antibodies inhibit PCSK9 and prevent destruction of LDL(R). These are able to reduce LDLc to 25–40 mg/dL (50–75% reduction) and are more potent and effective than statins and ezetimibe. Many clinical trials with PCSK9 monoclonal antibodies have demonstrated excellent efficacy and safety in a variety of patients including those with FH, non-FH, ASCVD, elevated CV risk and statin intolerance. The clinical trials have been classified as Phase 1, Phase 2 and Phase 3 trials. Some of the prominent trials are summarized in Tables 2–4. The reductions in LDLc vs placebo/statin/ezetimibe have ranged 45–70%. In addition, there has been reduction in total cholesterol (26–38%), Apo-B (34–52%), triglyceride (12–26%) and Lp (a) (15–31%). There has been a marginal nonsignificant increase in HDLc (2–8%). Abbreviations: PCSK9, proprotein convertase subtilisin/kexin type 9; LDLc, low-density lipoprotein cholesterol; HoFH, homozygous familial hypercholesterolemia; LDL(R), low-density lipoprotein receptor; TG, triglyceride; HeFH, heterozygous familial hypercholesterolemia. Abbreviations: LDLc, low-density lipoprotein cholesterol; LDL, low-density lipoprotein; TG, triglyceride; HeFH, heterozygous familial hypercholesterolemia. Abbreviations: SC, subcutaneous; LDLc, low-density lipoprotein cholesterol; CV, cardiovascular; HeFH, heterozygous familial hypercholesterolemia; FH, familial hypercholesterolemia; LDL, low-density lipoprotein. All three monoclonal antibodies have been evaluated in Phase 2 trials (Table 2). Evolocumab has undergone trials such as LAPLACE-TIMI 56,20 MENDEL-1,21 GAUSS,22 TESLA-A23 and RUTHERFORD.24 Each trial was of 12 weeks. Details of patient selection and the results are summarized in Table 2. There was reduction of LDLc by 41–66%. In HoFH, the LDL reduction was related to the presence/absence of LDL(R). There was no response in LDL(R)-negative patients and partial response in LDL(R)-defective patients. There was good response to Evolocumab in statin-intolerant patients (GAUSS trial). Alirocumab has been investigated in ROTH study,25 Stein study26 and McKenney study.27 LDLc reduced by 31–72% in various studies. Both Alirocumab and Evolocumab also significantly reduced Apo-B, total cholesterol, triglyceride and non-HDLc. There were no clear drug-related toxicity reactions during 12-week study period. Bococizumab is a humanized monoclonal antibody which binds with PCSK9 and reduces LDLc in patients with hypercholesterolemia. Ballantyne et al28 published results of Bococizumab in a Phase 2 trial of 24 weeks. It was a multicenter, double-blind, placebo-controlled, dose-ranging study in 354 patients on stable statin therapy with LDLc ≥80 mg/dL. The patients were randomized to 14- or 28-day treatment regime. In the 14-day regime, the patients were administered placebo (n=50) or Bococizumab once in 2 weeks at a dose of 50 (n=50), 100 (n=52) and 150 mg (n=50). In the 28-day regime, the patients received placebo (n=51) or Bococizumab at doses of 200 (n=50) or 300 mg (n=51). Compared with placebo, Bococizumab 150 mg Q 14 days reduced LDLc at week 12 by 53.4 mg/dL, and Bococizumab 300 mg Q 28 days reduced LDLc by 44.9 mg/dL. The dose of Bococizumab was reduced if LDLc was <25 mg/dL, and this threshold was achieved frequently. Adverse events were almost similar across placebo and Bococizumab groups. Seven patients (2%) discontinued treatment. Most frequent adverse events were nasopharyngitis, diarrhea, bronchitis, arthralgia and injection-site reactions. Evolocumab has been evaluated in MENDEL-2,29 GAUSS-2,30 OSLER-2,31 TESLA-B,32 LAPLACE-2,33 DESCARTES34 and RUTHERFORD-2.35 DESCARTES34 and OSLER-231 have been long-term trials lasting 52 weeks. The characteristics of patients and trials are depicted in Table 3. There was a consistent reduction in LDLc by over 50% in most trials. The adverse reactions included injection-site reactions, mild neurocognitive impairment of memory and anemia. Alirocumab has undergone Phase 3 trials such as ODYSSEY LONG TERM,36 ODYSSEY COMBO II,37 ODYSSEY FH,38 ODYSSEY ALTERNATE39 and ODYSSEY MONO,40 each lasting 12–24 weeks. The details of the trials are shown in Table 4. Phase 3 trials with Bococizumab consist of SPIRE which is an extensive research program carried out to study Bococizumab under various conditions. The trials include SPIRE-SI, SPIRE-AI (Auto Injector), SPIRE-HR, SPIRE-FH, SPIRE-LDL, SPIRE-1 and SPIRE-2. SPIRE-AI: Pfizer recently announced positive results from Phase 3 SPIRE-AI lipid-lowering study evaluating Bococizumab. It was a 12-week double-blind, placebo-controlled, randomized, parallel-group, multicenter trial on 299 patients with hyperlipidemia receiving statin therapy and with LDL ≥70 mg/dL. Bococizumab was administered subcutaneously at doses of 75 or 150 mg by auto-injector-prefilled pen device. The end points were percent LDLc reduction at 12 weeks and the success rate of delivery system. The results await publication. SPIRE-FH is a Phase 3, placebo-controlled trial in patients with HeFH which evaluates efficacy of 50 mg Bococizumab given once in 14 days for 12 months and studies percent reduction of LDLc at 12 weeks. SPIRE-HR and SPIRE-LDL are Phase 3 multicenter trials in patients with mixed dyslipidemia and hypercholesterolemia who will receive Bococizumab 150 mg once in 2 weeks for 12 months. Primary end point in both trials is percent change in baseline LDLc at 12 weeks. Secondary end points include changes in total cholesterol, Apo-B, HDLc and triglycerides. 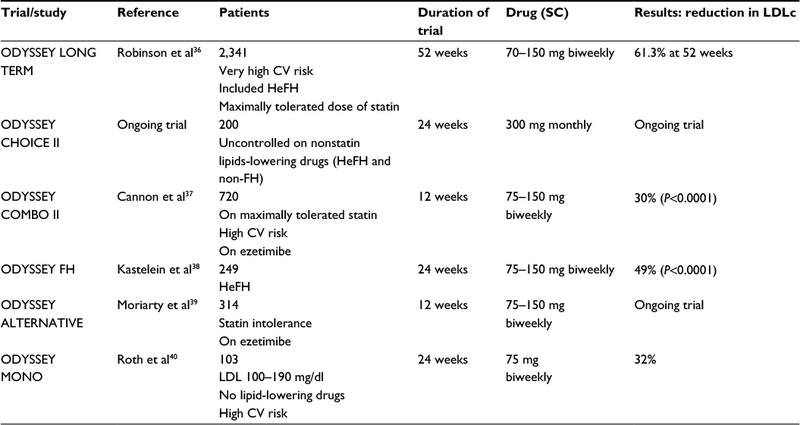 SPIRE-SI will evaluate the role of Bococizumab in patients with primary or mixed hyperlipidemia who are intolerant to statin and have high CV risk with LDLc >70 mg/dL and triglyceride ≤400 mg/dL. Primary end point will be percent change in baseline LDLc at 12 weeks. SPIRE-1 and SPIRE-2 are long-term CV outcome studies involving 17,000 patients. SPIRE-2 is fully enrolled. The results are expected in 2018. 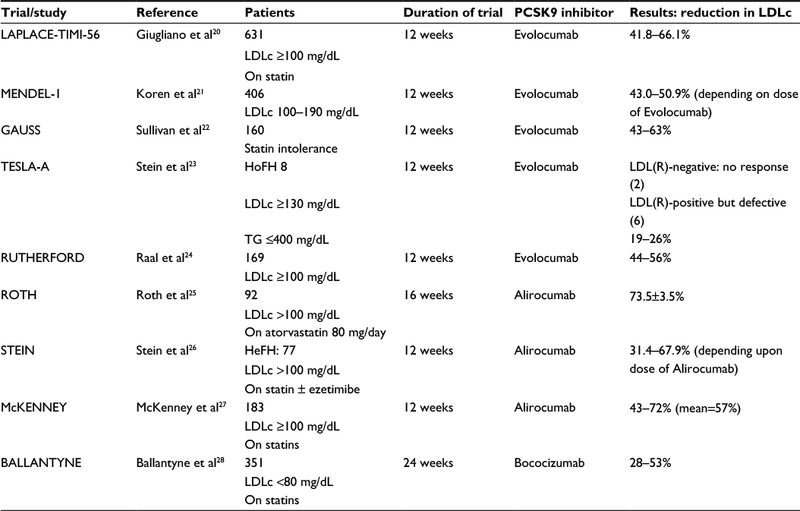 Two recent studies presented at ACC-15, ODYSSEY LONG TERM (for Alirocumab) and OSLER-1 and OSLER-2 trials (for Evolocumab), have evaluated the benefits of PCSK9 inhibitors with a longer follow-up duration of ≥52 weeks (Table 5). Abbreviations: LDLc, low-density lipoprotein cholesterol; HeFH, heterozygous familial hypercholesterolemia. ODESSEY LONG TERM trial36 included 2,341 high-risk patients with LDLc >70 mg/dL (Alirocumab, 1,553; placebo, 788). The baseline mean LDLc in Alirocumab group was 122.7±42.6 mg/dL, while in placebo group, it was 121.9±41.4 mg/dL. The LDLc at 24 and 48 weeks in Alirocumab vs placebo groups was 48.3 and 57.9 vs 118.9 and 122.6 mg/dL. At week 24, the difference between Alirocumab and placebo groups in the mean percent change from baseline was 62% points (P<0.001), and reduction in LDLc persisted throughout 78 weeks of follow-up .There was also a significant reduction in the levels of non-HDLc, Apo-B, total cholesterol, Lp (a) and fasting triglyceride with a mild increase in HDLc and Apo-A. The clinical event outcomes (reduction in death from CV causes, nonfatal myocardial infarction and unstable angina) were compared between the two groups in a post hoc analysis which showed ~50% reduction of adverse clinical outcomes with Alirocumab vs placebo (1.7% vs 3.3%, hazard ratio 0.52, 95% CI 0.31–0.90, P=0.02). The Alirocumab group as compared with placebo group had a higher rate of injection-site reaction (5.9% vs 4.2%), myalgia (5.4% vs 2.9%), neurocognitive events such as amnesia, memory impairment and confusion (1.2% vs 0.5%) and ophthalmic events (2.9% vs 1.9%). The authors concluded that Alirocumab when added to statin therapy at the maximum tolerated dose significantly reduced LDLc and the rate of CV events was also reduced. This study41 enrolled 4,465 patients which included 2,976 patients as Evolocumab group and 1,489 patients as placebo/standard therapy group. The patients were followed for ~11 months with periodic assessment of lipid levels, safety and adjusted CV events. Mean LDLc at baseline in Evolocumab and standard therapy groups was 120 (97–149) and 121 (97–151) mg/dL, respectively. After 11.1 months, Evolocumab reduced LDLc from a mean of 120 to 48 mg/dL (P<0.001), while there was no significant change in LDLc in standard therapy group (121–120 mg/dL). Thus, the reduction in LDLc by Evolocumab was by 61% (95% CI 59–63, P<0.01). In addition, there was reduction in non-HDLc (–52%), Apo-B (–47.3%), total cholesterol (–36.1%), triglyceride (–12.6%) and mild increase in HDLc (+7%). The rate of CV events (death, myocardial infarction, unstable angina and stroke) at 1 year was reduced from 2.18% in the standard group to 0.95% in Evolocumab group (hazard ratio in Evolocumab group 0.47, 95% CI 0.28–0.78, P=0.003). Most adverse reactions occurred with almost similar frequency in the two groups. The adverse reactions in Evolocumab vs standard group, respectively, were as follows: serious adverse reactions, 222 (7.5%) vs 111 (7.5%); muscle related, 190 (6.4%) vs 90 (6.0%); injection-site reaction, 129 (4.3%) vs nil; and neurocognitive events, 27 (0.9%) vs 4 (0.3%). The authors concluded that during 1 year of therapy, Evolocumab significantly reduced LDLc and also the incidence of CV events. Twenty-five RCTs encompassing 12,200 patients were included in the study42 to determine the safety and efficacy of anti-PCSK9 antibodies (Alirocumab and Evolocumab). The primary efficacy end points were the percent and absolute reductions in LDLc and other lipid profile changes at 52 weeks of follow-up. The safety outcomes were the rates of adverse events (Table 6). Note: “–” Indicates data not available. Abbreviations: PCSK9, proprotein convertase subtilisin/kexin type 9; LDLc, low-density lipoprotein cholesterol; HDL, high-density lipoprotein; CV, cardiovascular. The percent LDLc reduction following Evolocumab treatment was 54.6% (95% CI –58.7 to 50.5%) and absolute mean reduction was –78.9 mg/dL (95% CI –88.9 to –68.9 mg/dL) vs placebo and –36.3% (95% CI 38.86–33.9%) vs ezetimibe. HDLc increased by 7.6% (95% CI 5.7–9.5%) vs placebo and 6.4% (95% CI 4.3–8.4%) vs ezetimibe. Evolocumab generated significant reduction in total cholesterol, non-HDLc and VLDLc. The efficacy outcome for Alirocumab was on similar lines. LDLc reduced by over 50% (mean reduction –52.6%, 95% CI –58.2 to 47.0%) vs placebo. A less marked reduction of LDLc was found when compared with ezetimibe (–29.9%, 95% CI –32.9 to –26.95%). HDLc level increased by a mean of 8% (95% CI 4.2–11.7%). There was a reduction of total cholesterol, non-HDLc and Apo-B. Safety outcome judged by common adverse events essentially did not reveal significant differences between anti-PCSK9 antibodies and the placebo (or ezetimibe) except slightly increased rate of injection-site reactions (relative risk 1.48, 95% CI 1.5–2.09, P=0.02). The incidence of TEATs was 52.2% (95% CI 44.8–59.7%) at 12 weeks with PCSK9 antibodies vs 45.2% (95% CI 40.6–49.8%) with placebo. Serious TEATs occurred in 1.9%, leading to discontinuation of treatment with Evolocumab in 1.6% of patients at 12 weeks. Injection-site reactions were slightly more common in patients receiving anti-PCSK9 antibodies. The authors concluded that Evolocumab and Alirocumab were safe, well tolerated and showed no significant differences in rates of adverse events compared with placebo or ezetimibe controls. Navarese et al43 evaluated 24 trials (eight, Phase 2; 16, Phase 3 trials) comprising 10,159 patients. Most trials were short (<6 months: 17 trials). Duration was 6–12 months in two trials, and over 1 year in five trials. Efficacy of PCSK9 antibodies was based on 1) correction of lipid profile, 2) clinical outcome in terms of mortality and 3) incidence of adverse events. There was a reduction of LDLc by 47.49% (95% CI –69.64 to –25.235%, P<0.001) with a larger reduction when compared with placebo (–58.77%, 95% CI 56.5–61.5%) than when compared with ezetimibe (–36.17%, 95% CI 33.1–39.3%). There was reduction in total cholesterol by 31.9% and in lipoprotein by 26.4% and increase in HDLc (14 trials) by 6.3%. Use of PCSK9 antibodies was associated with a significant reduction in all-cause mortality rate (0.31% in anti-PCSK-treated group vs 0.53% in placebo group; OR 0.45, 95% CI 0.23–0.86, P=0.015); all-cause mortality was reduced by 41.5% by PCSK9 inhibitors when compared with placebo. A statistically nonsignificant reduction in CV mortality was observed with PCSK9 inhibitors (0.19%) vs placebo (0.33%) (OR 0.50, 95% CI 0.23–1.1, P=0.84). In addition, there was a significant reduction of secondary safety end point myocardial infarction vs placebo (OR 0.49, 95% CI 0.26–0.93, P=0.03). The overall incidence of serious adverse events and the rate of discontinuation of therapy were similar in the two groups. The authors concluded that their meta-analysis provides preliminary data on long-term efficacy and clinical outcome. However, their findings need further confirmation with prospective CVOTs which are being pursued currently. Lipinski et al44 have meta-analyzed a total of 17 trials involving 13,083 patients (8,250 given PCSK9 inhibitors, 846 given ezetimibe and 3,987 placebo). PCSK9 inhibition alone led to 57% lower LDLc, 36% lower total cholesterol, 46% lower Apo-B, 24.3% lower Lp (a) and 47% lower PCSK9 levels. Compared with placebo, PCSK9 and ezetimibe resulted in reduction of LDLc by 69% and 21%, respectively. Maximum reduction of LDLc of 57.8% was seen when PCSK9 inhibitors were given in patients with high baseline statin therapy (from basal level of 122 to 51 mg/dL). Many trials found at least one LDLc value as low as 25 mg/dL. All-cause mortality was reduced significantly (hazard ratio 0.43, 95% CI 0.27–0.48, P=0.01). CV mortality was reduced but not significantly (hazard ratio 0.50, 95% CI 0.23–1.13, P=0.10). CV events were reduced but not significantly (hazard ratio 0.67, 95% CI 0.43–1.04, P=0.07). Adverse events: neurocognitive events were increased with PCSK9 inhibitors (hazard ratio 2.31, 95% CI 1.11–4.93, P=0.01). The authors concluded that PCSK9 inhibitors significantly improve lipid profile and reduce all-cause mortality but are associated with increased neurocognitive events. The authors suggested adjusting the dose of PCSK9 inhibitors to keep LDLc in the range of 50–70 mg/dL. 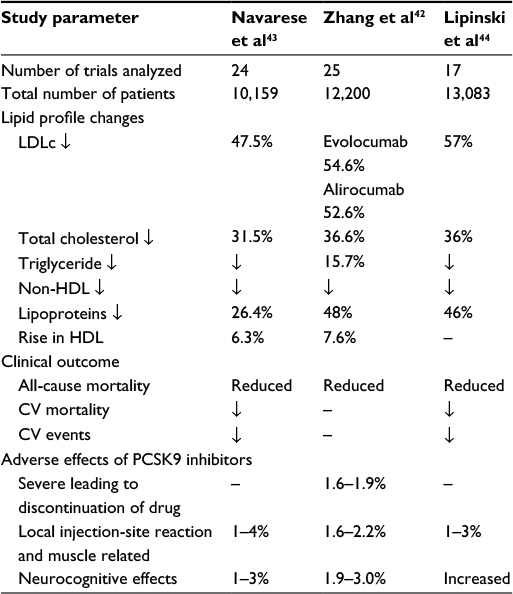 To summarize, PCSK9 inhibitors decreased LDLc effectively to an extent of ≥50% in all three meta-analyses. Navarese et al and Lipinski et al showed a significant reduction in all-cause mortality by PCSK9 inhibitors. There was a trend toward reduction in CV events. Zhang et al evaluated the safety outcome and the rates of adverse reactions. They found that PCSK9 inhibitors are safe and well tolerated. Local injection-site reactions, nasopharyngitis and mild muscular pains were found more frequently. Adverse reactions secondary to achieving very low-density lipoprotein levels (<50 mg/dL) included neurocognitive effects such as memory impairment. There were no differences in adverse effects due to different doses/regimens of Evolocumab. Whether PCSK9 inhibitors leading to remarkable reduction in LDLc will translate into improved CV outcome remains to be confirmed by long-term CVOTs. Use of PCSK9 inhibitors substantially reduces nonfatal myocardial infarction, nonfatal stroke and CV deaths over ≥5 years. Number of patients need to be treated for 5 years to avoid one major fatal CV event appears to be in favor of PCSK9 inhibitors. Draft ICER (2015)45 value-based price benchmark for PCSK9 inhibitors works out to be $2,177 per year. Hence, the present cost of $14,600 or $14,100 should be reduced by 85%. As of today, PCSK9 inhibitors are not cost-effective and will put extra burden on the government/insurance corporate. Using a “willingness to pay” threshold of $50,000 per QALY gained, PCSK9 inhibitors should cost $2,100 per year for FH patients. However, for secondary prevention, the cost could be $2,400–2,700 per year. Amgen and Sanofi have not agreed with the ICER analysis and feel that the reviewers have not addressed the unmet clinical need of the patients and the draft report of ICER will only create a barrier to the patients who need PCSK9 inhibitors the most. However, high cost will remain a major block in the use of monoclonal antibodies in clinical practice. Hence, there is an unmet need to discover cheaper analogs to inhibit PCSK9. The cost of PCSK9 inhibitors in the UK is 4,000 sterling pounds ($5,700) for NHS patients. In Europe, the cost is €6,200–7,000. PCSK9 inhibitors have been used in patients with FH, severe statin intolerance and non-FH. HoFH is due to either totally absent or grossly abnormal LDL(R) due to two identical mutations in genes. Fortunately, it is an extremely rare disease. Fasting LDLc is markedly elevated. HoFH presents clinically with marked tendinous xanthomas, premature ASCVD and premature death. Treatment with statins and PCSK9 inhibitors is cost-effective in HoFH for primary and secondary prevention. HeFH is due to single mutation of LDL(R) gene. LDL(R) is defective but not absent. The prevalence of HeFH in Copenhagen general population has been recently estimated as one in 217.47 This prevalence is based upon Dutch Lipid Clinic Network criteria and estimated LDLc level ≥4.4 mmol/L (165 mg/dL). HeFH is also complicated with early ASVD. The European Atherosclerosis Society Consensus Panel II advises intensive statin therapy when the individuals of HeFH attain the age of 8–12 years.48 Addition of PCSK9 inhibitors is a viable option if the response of intensive statin therapy is inadequate49 or when associated with ASCVD. Patients with mild statin intolerance are often managed successfully with reduction of statin dose or change to rosuvastatin from atorvastatin or other brand of statin. However, in severe statin intolerance, this policy may not be successful. PCSK9 inhibitors may be an effective alternative in patients with severe ASCVD with statin intolerance. Non-FH associated with existing ASVD need intensive statin therapy with/without ezetimibe. However, substantial heterogeneity in response to statin therapy has been reported in a meta-analysis of eight CV outcomes8 and the JUPITER TRIAL.50 RRR of CV events is proportional to the magnitude of LDLc reduction. In Ridker et al analysis, an RRR of 39% was observed for those with ≤50% LDLc reduction and a relative risk of breast cancer of 59% was observed with ≥59% LDLc reduction. Ridker et al50 suggested that patients with inadequate LDLc reduction by statin therapy may benefit with an additional therapy, for example, ezetimibe or PCSK9 inhibitors. However, PCSK9 inhibitors are costly. Their use may be considered by lipid experts in patients with non-FH with severe existing ASCVD and CV risk ≥10%, depending upon the insurance coverage, national economy and policy of the country. The exact number of prescriptions of PCSK9 inhibitors and refusal of payment by insurance companies is not known. According to newsletter from the “Frontiers of Health and Medicine” by ED Silverman (April 2016), there were 9,500 prescriptions of Evolocumab and 11,800 prescriptions for Alirocumab with the FDA-approved indications from August 2015 to February 2016 with a refusal rate of 75% by insurance companies. These have remained the hottest topic of debate during 2015–2016. According to the prevalence rate of HeFH in the USA, total HeFH patients could be more than two million, and the cost of PCSK9 inhibitors for 5 years (or lifelong) would run in several billion dollars. Kazi et al53 used Cardiovascular Diseases Policy Model and included adults aged 35–94 years. The simulated model estimated a cost of $423,000 per QALY for PCSK9 inhibitors and a cost of $503,000 per QALY for PCSK9 inhibitors plus statin in patients of HeFH. The US health care cost will increase by $565 billion over 5 years. The cost of treating a CV event like myocardial infarction includes direct cost of diagnosis and treatment in cardiac institutions and indirect cost of lost work productivity and unemployment, besides mental agony and death. The AHA estimated direct and indirect cost of medical care for ASCVD as $450 billion in 2010.54 The cost is likely to increase during 2010–2030. Whether, and to what extent, PCSK9 inhibitors will facilitate a reduction in total cost of ASCVD remains to be seen in future. In the meantime, pricey PCKS9 inhibitors require careful patient selection. Gandra et al55 have hypothesized that Evolocumab when added to SOC vs SOC alone is cost-effective in patients with HeFH and ASCVD with or without statin intolerance. Treatment was associated with increased cost and improved QALY: 1) for HeFH: incremental cost US$153,289, incremental QALY 2.02 and incremental cost-effectiveness ratio $75,863/QALY; 2) for ASCVD: incremental cost $158,307, incremental QALY 1.2 and incremental cost-effectiveness ratio 141,699/QUALY. Thus, Evolocumab met the ACC/AHA and World Health Organization thresholds in this population. PCSK9 inhibitors are safe and nontoxic. No life-threatening adverse effects have been reported. Monoclonal antibodies need to be given by subcutaneous injection only. Many patients have injection phobia and never agree to frequent injection for 1–5 years or lifelong. Although painless pen-filled injections are available, the idea of self-injection is not always welcome. Of the total patients, 2–10% develop injection-site reactions. Research for orally active small molecules as PCSK9 inhibitors is under progress by a few pharmaceutical companies (Pfizer, Seromatrix and Bristol-Squibb). Whenever available in future, orally effective analogs of PCSK9 inhibitors will be a welcome addition to anti-lipid drugs. Nonspecific drug-induced adverse events include upper respiratory infections, diarrhea and myalgia in 1–2% of patients. Reactions due to VLDLc (<40 mg/dL). Neurocognitive events include impaired memory, headache and confusion (1–4%). There is no increased incidence of stroke or intracranial hemorrhage. Hormonal insufficiency, especially of adrenal cortex, visceral adiposity and impaired glucose tolerance, has been suspected due to LDLc <25 mg/dL in some patients. Reduction in LDLc is often regarded as a surrogate measure of clinical benefits.1–5 LDLc reduction was the basis of the FDA approval of statins in 1987. IMPROVE-IT (statin with ezetimibe) study further strengthened this concept.9 CTT meta-analysis of over 170,000 patients in 26 randomized trials4 observed a 25% reduction in major vascular events for each 1 mmol/L (38.7 mg/dL) reduction in LDLc by statins. However, ILLUMINATE trial with Torcetrapib56 and HPS-2 THRIVE trial57 with Niacin which could lower LDLc were not associated with favorable clinical outcome. Hence, establishing evidence of improved clinical CV outcomes (CVOT) is the key to evaluate new class of medication .The ongoing prospective CVOTs include FOURIER evaluating Evolocumab in 27,500 patients, ODYSSEY OUTCOME evaluating Alirocumab in 18,000 patients and SPIRE-1 and SPIRE-2 evaluating Bococizumab in 17,000 patients (Table 7). The results of CVOT are expected in 2017–2018. Abbreviations: PCSK9 proprotein convertase subtilisin/kexin type 9; LDLc, low-density lipoprotein cholesterol; CV, cardiovascular; MI, myocardial infarction; HDL, high-density lipoprotein; TG, triglyceride; Apo-B, apolipoprotein B; LDL, low-density lipoprotein. Monoclonal antibodies are potent inhibitors of PCSK9 and prevent destruction of LDL(R) with marked reduction of LDLc compared to statin and ezetimibe. A target LDLc of 40–60 mg/dL is possible with PCSK9 inhibitors. Health care benefits with monoclonal antibodies appear substantial in FH (more in HoFH than in HeFH patients). If the relationship between LDLc reduction and clinical benefits is proved in CVOT studies, one can expect 30–40% reduction in vascular events with PCSK9 inhibitors even in patients with non-FH with existing ASCVD and uncontrolled hypercholesterolemia in spite of maximally tolerated statin with or without ezetimibe. PCSK9 inhibitors are indicated for treatment of FH, and it may be considered cost-effective in HoFH and also HeFH patients with severe existing ASCVD and severe statin intolerance. In non-FH with ASCVD and high CV risk ≥10%, their use will depend upon the economic and national policies of the country in view of their high cost. Expert Panel on Detection, Evaluation and Treatment of High Blood Cholesterol in Adults. Executive summary of the third report of the national Cholesterol Education Programme (NCEP). Expert Panel on Detection, Evaluation and Treatment of High Blood Cholesterol in Adults (Adult Treatment Panel III). JAMA. 2001;285(19):2486–2497. O’Keefe JH Jr, Cordain L, Harris WH, Moe RM, Vogel R. Optimal low density lipoprotein is 50-70 mg/dl; lower the better and physiologically normal. J Am Coll Cardiol. 2004;43(11):2142–2146. Ahmed S, Cannon CP, Murphy SA, Braunwald E. Acute coronary syndrome and diabetes: is intensive lipid lowering beneficial? Result of the PROVE IT-TIMI 22 trial. Eur Heart J. 2006;27(19):2323–2329. Cholesterol Treatment Trialists’ (CTT) Collaboration; Baigent C, Blackwell L, Emberson J, et al. Efficacy and safety of more intensive lowering of LDL cholesterol: a meta analysis of data from 170,000 participants in 26 randomized trials. Lancet. 2010;376(9753):1670–1681. Stone NJ, Robinson JG, Lichtenstein AH, et al. American College of Cardiology/American Heart Association Task Force on Practice Guidelines. 2013 ACC/AHA guideline on the treatment of blood cholesterol to reduce atherosclerotic cardiovascular risk in adults: a report of the American College of Cardiology/American Heart Association Task Force on Practice Guidelines. J Am Coll Cardiol. 2014;63(25 Pt B):2889–2934. Perk J, De Backer G, Gohlke H, et al. European Association for Cardiovascular Prevention & Rehabilitation (EACPR); ESC Committee for Practice Guidelines (CPG). European guidelines on cardiovascular disease prevention in clinical practice (version 2012). The Fifth Joint Task Force of the European Society of Cardiology and Other Societies on Cardiovascular Disease Prevention in Clinical Practice (constituted by representatives of nine societies and by invited experts). Eur Heart J. 2012;33(13):1635–1701. Anderson TJ, Greogoire J, Hegele RA, et al. 2012 update of the Canadian Cardiovascular Society guidelines for the diagnosis and treatment of dyslipidemia for the prevention of cardiovascular disease in adults. Can J Cardiol. 2013;29(2):151–167. Boekholdt SM, Hovingh GK, Mora S, et al. Very low levels of atherogenic lipoproteins and risk for cardiovascular events: a meta-analysis of statin trials. J Am Coll Cardiol. 2014;64(5):485–494. Cannon CP, Blazing MA, Giugliano RP, et al. IMPROVE-IT Investigators. Ezetimibe added to statin therapy after acute coronary syndromes. IMPROVED reduction of outcome Vytorin Efficacy International Trial (IMPROVE-IT). N Engl J Med. 2015;372;2387–2397. Seidah NG. Proprotein convertase subtilisin kexin 9 (PCSK9) inhibitors in the treatment of hypercholesterolemia and other pathologies. Curr Pharm Des. 2013;19(17):3161–3172. Everett BM, Smith RJ, Hiatt WR. Reducing LDL with PCSK9 inhibitors – the clinical benefit of lipid drugs. N Engl J Med. 2015;373(17):1588–1591. Stoekebroek RM, Kastelein JJ, Huijgen R. PCSK9 inhibition: the way forward in the treatment of dyslipidemia. BMC Med. 2015;13:258–263. Giugliano RP, Sabatine MS. Are PCKS9 inhibitors the next breakthrough in the cardiovascular field? J Am Coll Cardiol. 2015;65(24):2638–2651. Abifadel M, Varret M, Rabes JP, et al. Mutations in PCSK9 cause autosomal dominant hypercholesterolemia. Nat Genet. 2003;34(2);154–156. Seidah NG, Benjannet S, Wickham L, et al. The secretory proprotein convertase neural apoptosis-regulated convertase I (NARC-1): liver regeneration and neuronal differentiation. Proc Natl Acad Sci U S A. 2003;100(3):928–933. Cohen JC, Boerwinkle E, Mosley TH Jr, Hobbs HH. Sequence variations in PCSK9, low LDL, and protection against coronary heart disease. N Engl J Med. 2006;354(12):1264–72. Lambert G, Petrides F, Chatelias M, et al. Elevated plasma PCSK9 levels are equally detrimental for patients with non familial hypercholesterolemia and heterozygous familial hypercholesterolemia, irrespective of low density lipoprotein receptor defects. J Am Coll Cardiol. 2014;63(22):2365–75. Hori M, Ishihara M, Yuasa Y, et al. Removal of plasma mature and furin-cleaved proprotein convertase subtilisin/kexin 9 by low density lipoprotein-apheresis in familial hypercholesterolemia: development and application of a new assay for PCSK9. J Clin Endocrinol Metab. 2015;100(1):E41–E49. Tavori H, Christian D, Minnier J, et al. PCSK9 association with lipoprotein (a). Circ Res. 2016;119:29–35. Giugliano RP, Desai NR, Kohli P, et al. LAPLACE-TIMI 57 Investigators. Efficacy, safety and tolerability of a monoclonal antibody to proprotein convertase subtilisin/kexin type 9 in combination with a statin in patients with hypercholesterolemia (LAPLACE-TIMI 57): a randomised, placebo-controlled, dose-ranging, phase 2 study. Lancet. 2012;380(9598);2007–2017. Koren MJ, Scott R, Kim JB, et al. Efficacy, safety and tolerability of a monoclonal antibody to proprotein convertase subtilisin/kexin type 9 as monotherapy in patients with hypercholesterolemia (MENDEL): a randomised, double-blind, placebo-controlled, phase 2 study. Lancet. 2012;380(9858):1995–2006. Sullivan D, Olsson AG, Scott R, et al. Effect of a monoclonal antibody to PCSK9 on low-density lipoprotein cholesterol levels in statin-intolerant patients: the GAUSS randomized trial. JAMA. 2012;308(23);2497–2506. Stein EA, Honarpour N, Wasserman SM, Xu F, Scott R, Raal FJ. Effect of the proprotein convertase subtilisin/kexin 9 monoclonal antibody, AMG 145, in homozygous familial hypercholesterolemia. Circulation. 2013;128(19):2113–2120. Raal F, Scott R, Somaratne R, et al. Low-density lipoprotein cholesterol-lowering effects of AMG 145, a monoclonal antibody to proprotein convertase subtilisin/kexin type 9 serine protease in patients with heterozygous familial hypercholesterolemia: the Reduction of LDL-C with PCSK9 inhibition in Heterozygous Familial Hypercholesterolemia Disorder (RUTHERFORD) randomised trial. Circulation. 2012;126(20):2408–2417. Roth EM, McKenney JM, Hanotin C, Asset G, Stein EA. Atorvastatin with or without an antibody to PCSK9 in primary hypercholesterolemia. N Engl J Med. 2012;367(20):1891–900. Stein EA, Gipe D, Bergeron J, et al. Effect of a monoclonal antibody to PCSK9, alirocumab to reduce low-density lipoprotein cholesterol in patients with heterozygous familial hypercholesterolemia on stable statin dose with or without ezetimibe therapy: a phase 2 randomised controlled trial. Lancet. 2012;380(9836):29–36. McKenney JM, Koren MJ, Kereiakes DJ, Hanotin C, Ferrand AC, Stein EA. Safety and efficacy of a monoclonal antibody to proprotein convertase subtilisin/kexin type 9 serine protease, alirocumab, in patients with primary hypercholesterolemia receiving ongoing stable atorvastatin therapy. J Am Coll Cardiol. 2012;59(25):2344–2353. Ballantyne CM, Neutel J, Cropp A, et al. Results of Bococizumab, a monoclonal antibody against proprotein convertase subtilisin/kexin type 9, from a randomized, placebo-controlled, dose-ranging study in statin-treated subjects with hypercholesterolemia. Am J Cardiol. 2015;115(9):1212–1221. Koren MJ, Lundqvist P, Bolognese M, et al. MENDEL-2 Investigators. Anti-PCSK9 monotherapy for hypercholesterolemia: the MENDEL-2 randomized, controlled phase III clinical trial of evolocumab. J Am Coll Cardiol. 2014;63(23):2531–2540. Stroes E, Colquhoun D, Sullivan D, et al. GAUSS-2 Investigators. Anti-PCSK9 antibody effectively lowers cholesterol in patients with statin intolerance: the GAUSS-2 randomized, placebo-controlled phase 3 clinical trial of evolocumab. J Am Coll Cardiol. 2014;63(23):2541–2548. Koren MJ, Giugliano RP, Raal FJ, et al. OSLER Investigators. Efficacy and safety of longer-term administration of evolocumab in patients with hypercholesterolemia: 52-week results from the Open-Label Study of Long-Term Evaluation against LDL-C (OSLER) randomized trial. Circulation. 2014;129(2):234–243. Raal FJ, Honarpour N, Blom DJ. TESLA Investigators. Inhibition of PCSK9 with evolocumab in homozygous familial hypercholesterolemia (TESLA Part B): a randomized, double-blind, placebo-controlled trial. Lancet. 2015;385(9965):341–350. Robinson JG, Nedergaard BS, Rogers WJ, et al. LAPLACE-2 Investigators. Effect of evolocumab or ezetimibe added to moderate – or high-intensity statin therapy on LDLc lowering in patients with hypercholesterolemia: the LAPLACE-2 randomized clinical trial. JAMA. 2014;311(18):1870–1882. Bloom DJ, Hala T, Bolognese M, et al. A 52-week placebo-controlled trial of evolocumab in hyperlipidemia. N Engl J Med. 2014;370(19):1809–1819. Raal FJ, Stein EA, Dufour R, et al. RUTHERFORD-2 Investigators. PCSK9 inhibition with evolocumab (AMG145) in heterozygous familial hypercholesterolemia (RUTHERFORD-2): a randomised, double-blind, placebo-controlled trial. Lancet. 2015;385(9965):331–340. Robinson JG, Farnier M, Krempf M, et al. Efficacy and safety of alirocumab in reducing lipids and cardiovascular events (ODYSSEY LONG TERM Investigators). N Engl J Med. 2015;372(16):1489–1499. Cannon CP, Cariou B, Blom D, et al. ODYSSEY COMBO II Investigators. Efficacy and safety of alirocumab in high cardiovascular risk patients with inadequately controlled hypercholesterolemia on maximally tolerated doses of statins: the ODYSSEY COMBO II randomised controlled trial. Eur Heart J. 2015;36(19):1186–1194. Kastelein JJ, Robinson JG, Farnier M, et al. Efficacy and safety of alirocumab in patients with heterozygous familial hypercholesterolemia not adequately controlled with current lipid-lowering therapy: design and rationale of the ODYSSEY FH studies. Cardiovasc Drugs Ther. 2014;28(3):281–289. Moriarty PM, Jacobson TA, Bruckert E, et al. 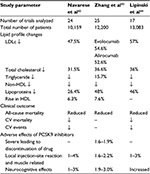 Efficacy and safety of alirocumab, a monoclonal antibody to PCSK9, in statin-intolerant patients: design and rationale of ODYSSEY ALTERNATIVE, a randomised phase 3 trial. J Clin Lipidol. 2014;8(6):554–561. Roth EM, Taskinen MR, Ginsberg HN, et al. Monotherapy with the PCSK9 inhibitor alirocumab versus ezetimibe in patients with hypercholesterolemia: results of a 24 week, double-blind, randomized Phase 3 trial. Int J Cardiol. 2014;176(1):55–61. Sabatine MS, Giugliano RP, Wiviott SD, et al. Efficacy and safety of Evolocumab in reducing lipids and cardiovascular events (Open-Label Study of Long-term Evaluation against LDL Cholesterol Investigators) (OSLER). N Engl J Med. 2015;372(16):1500–1509. Zhang XL, Zhu QQ, Zhu L, et al. Safety and efficacy of anti-PCSK9 antibodies: a meta-analysis of 25 randomized, controlled trials. BMC Med. 2015;13:123. Navarese EP, Kolodziejczak M, Schulze V, et al. Effects of proprotein convertase subtilsin/kexin type 9 antibodies in adults with hypercholesterolemia: a systematic review and meta-analysis. Ann Intern Med. 2015;163(1):41–49. Lipinski MJ, Benedetto U, Escarcega RO, et al. The impact of proprotein convertase subtilisin/kexin type 9 serine protease inhibitor on lipids levels and outcomes in patients with primary hypercholesterolemia: a network meta-analysis. Eur Heart J. 2016;37(6):536–545. ICER Draft Report 2015. 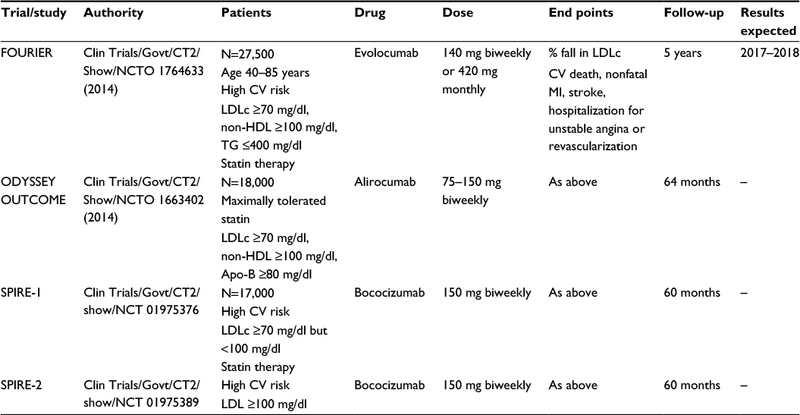 PCSK9 inhibitors for treatment of high cholesterol: effectiveness, value and value-based price benchmarks. Institute for Clinical and Economic Review. Published online 8 September 2015. Nordestgaard BG, Chapman MJ, Humphries SE, et al. European Atherosclerosis Society Consensus Panel. Familial hypercholesterolemia is under diagnosed and undertreated in the general population: guidance for clinicians to prevent coronary heart disease: consensus statement of the European Atherosclerosis Society. Eur Heart J. 2013;34(45):3478–3490a. Benn M, Watts GF, Tybjaerg-Hansen A, Nordestgaard BG. Mutations causative of familial hypercholesterolemia: screening of 98098 individuals from the Copenhagen General Population Study estimated a prevalence of 1 in 217. Eur Heart J. 2016;37(17):1384–1394. Wiegman A, Gidding SS, Watts GF, et al. European Atherosclerosis Society Consensus Panel. Familial hypercholesterolemia in children and adolescents: gaining decades of life by optimizing detection and treatment. Eur Heart J. 2015;36(36):2425–2437. Vuorio A, Watts GF, Kovenan PT. Initiation of PCSK9 inhibition in patients with heterozygous familial hypercholesterolemia entering adulthood: a new design for living with a high-risk condition? Eur Heart J. 2016;37:1353–1356. Ridker PM, Mora S, Rose L. JUPITER Trial Study Group. Percent reduction in LDL cholesterol following high-intensity statin therapy: potential implications for guidelines and for the prescription of emerging lipid-lowering agents. Eur Heart J. 2016;37(17):1373–1379. Glueck CJ, Shah P, Goldenberg N, et al. 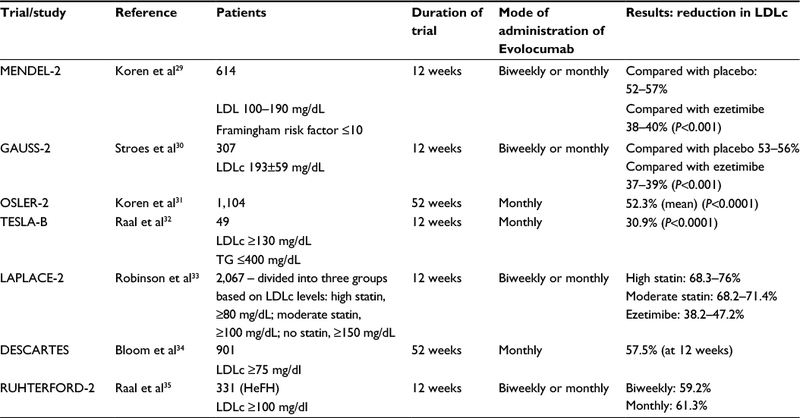 Eligibility for PCSK9 treatment in 734 hypercholesterolemic patients referred to a regional cholesterol treatment centre with LDL cholesterol ≥ 70 mg/dl despite maximal tolerated cholesterol lowering therapy. Lipids Health Dis. 2016;15:55. Torjesen I. NICE draft guidance recommends PCSK9 inhibitors for high risk cardiovascular patients. Pharm J. 2016;296(7889):20201125. Kazi DS, Moran AE, Coxson PG, et al. Cost-effectiveness of PCSK9 inhibitor therapy in patients with homozygous familial hypercholesterolemia or atherosclerotic cardiovascular disease. JAMA. 2016;316(7):743–753. Wintraub WS, Daniels SR, Burek LE, et al. American Heart Association Advocacy Coordinating Committee; Council on Cardiovascular Disease in the Young; Council on the Kidney in Cardiovascular Disease; Council on Epidemiology and Prevention; Council on Cardiovascular Nursing; Council on Arteriosclerosis; Thrombosis and Vascular Biology; Council on Clinical Cardiology, and Stroke Council. Value of primordial and primary prevention for cardiovascular disease: a policy statement from American Heart Association. Circulation. 2011;124(8):967–990. Gandra SR, Villa G, Fonarow GC, et al. Cost-effectiveness of LDLc lowering with evolocumab in patients with high cardiovascular risk in the United States. Clin Cardiol. 2016;39(6):313–320. Barter PJ, Caulfied M, Eriksson M, et al. Effects of Torcetrapib in patients at high risk for coronary events. N Engl J Med. 2007;357:2109–2122. HPS-2 THRIVE Trial Collaborative Group, Landray MJ, Haynes R, Hopewell JC, et al. Effects of extended release niacin with laropiprant in high risk patients. N Engl J Med. 2014;371(3):203–212.